In 2010, 12% or 268,000 youths aged 15 to 19 reported being current smokers. This is a decrease of three percentage points from 2007 and continues the downward trend in youth smoking seen since 1999. Teens aged 18 to 19 are more likely to smoke than younger teens aged 15 to 17 (18% versus 9% in 2010). About 7% of young people reported smoking daily in 2010, consuming an average of 11.6 cigarettes per day, whereas 5% reported smoking occasionally. 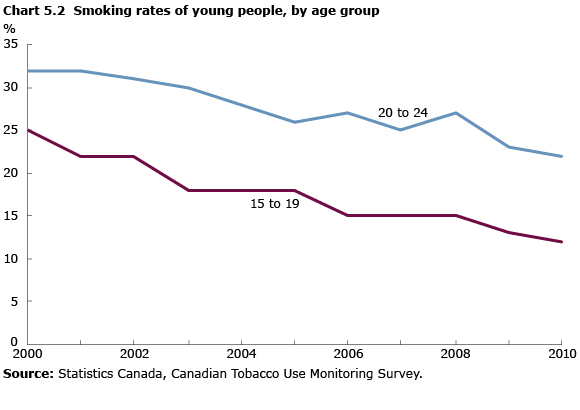 Smoking rates among youth did not vary significantly by gender in 2010, but there were large differences among the provinces: 20% of youth in Saskatchewan reported smoking daily, compared with 9% in British Columbia and Ontario. Those aged 15 to 19 were more likely to report never having smoked (86%) than those aged 20 to 24 (70%). Younger smokers were also more likely to attempt quitting than older smokers. Over two-thirds (69%) of daily smokers aged 15 to 19 attempted to quit at least once in 2010, but 56% of those aged 25 and older made no attempt.